The last week and a half have been extremely exciting! Last Wednesday and Thursday (6/13 and 6/14) we had our first read-throughs. Meghan Brown (the playwright) was able to join us, and she got a lot of feedback and ideas. On Monday, we started blocking--figuring out where the actors go and what they do at each point in the scene--, and have had blocking rehearsals every weeknight this week. Meghan worked incredibly hard to get us a new draft of the script on Tuesday. Working on original scripts with the playwrights is an amazing experience. The set crew was also hard at work this week. They installed the foundations of the stage, and we now have the first story of the set to play on. 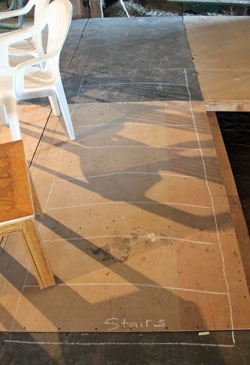 Every day we'd come in to rehearsal and there'd be a new section added, with helpful lines drawn in with chalk to show us important things, like where the stairs are, or what line Anthony Pinto (playing Peter) should not cross lest he plummet from the upper story. (Psyche) and Anthony to send on to our poster designer, Liz Hadden. Wednesday brought us an unfortunate visitor. While rehearsing a scene with Jason Oler (Ali) and Alison Whismore (Vera), a vole (already deceased, thankfully) landed on the stage. We're guessing the barn owl had left it on a rafter, and the wind knocked it down. Needless to say, it was disruptive, strange, and a little disconcerting, though we managed to carry on after taking it somewhere a little more appropriate than downstage-left. We will definitely be checking the rafters to make sure no more surprises descend on us (or you, our lovely audience, we promise!) over the course of the run. It's just one of the many things that make Barnyard Theatre totally unlike most other theatre experiences. Next week we'll finish blocking one more scene, and stumble our way through both acts. We'll finish up the week working on scenes to fill in the rough details, polish them, make them shine! The set crew is beginning the task of building the second story and the first story exit/entrance paths. Monday and Tuesday, many of the designers are visiting rehearsal, which will probably clear up many questions and open up many more. Tiffany Michael is Stage Manger for Psyche and Or, as well as Associate Producer and a member of the Barnyard Theatre board.